The Acer ICONIA W700 blends Ultrabook performance and tablet mobility with Windows 8 touch capabilities for hands-on multimedia in brilliant clarity. Grab your tablet to go or attach it to the dock and use as a full function PC with the included Bluetooth keyboard. It also acts as the perfect stand for sharing or viewing content as you view, touch and browse on demand. And with 9 hours of battery life, your digital life is always just a touch away. 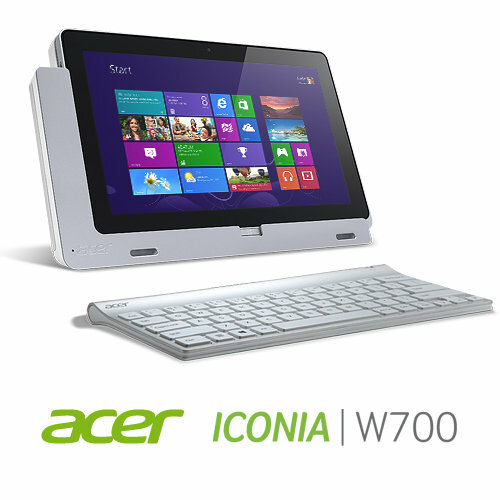 The Acer® ICONIA W700 provides Ultrabook performance in a tablet with Windows 8 OS for a smooth, hands-on multimedia experience. The gorgeous 11.6″ Full HD display features 10-point touch and wide viewing angles of up to 178°, making the ICONIA a visual delight. Create content, social network, watch movies and play games. The visibly smart 3rd gen Intel® Core™ i3 processor delivers amazing performance and stunning visuals so you can experience your movies, photos and games smoothly and seamlessly. Get a boost in your performance that you can truly see and feel. The Micro-HDMI Port transfers 1080p HD video to an external monitor, projector or TV for large-screen enjoyment and sharing of HD content with friends and family (Cable sold separately). Windows 8 has been re-imagined to be all about you. Put what matters most right on your Start screen, and get instant access to your people, apps, sites and more, so you can spend less time searching and more time doing. Windows 8 is smooth, intuitive, and designed to let you do what you want, the way you want. Check the morning news, update your social media at lunch, and book a restaurant reservation in the evening, with up to 9 hours of battery life you have the entire day to do what you want. The ICONIA W700 is the perfect blend of portability and productivity. Grab it on the go in tablet mode, or attach it to the dock and use as a full function PC with the included Bluetooth keyboard. Three USB 3.0 ports, on the dock, make connections to peripherals such as mouse, monitor or external storage easy and you can even charge your USB devices when your tablet is off! View, touch and browse on demand! The dock is the perfect stand for sharing or viewing content in both high and low angles in landscape and portrait mode. Dolby® Home Theater® v4 delivers a cinematic surround sound experience on your Tablet. Pop it into the dock and that sound is amplified through a specially designed sound tunnel, eliminating the need for external speakers. Launch the Acer Ring for a unique touch interface that is out-of-this-world providing a fast and seamless way to view documents, play music, browse the web and view photos and videos. Acer Green Instant On gives you fast responsiveness and powerful computing by booting in 6 seconds, thanks to the SSD, and resuming from sleep in just 1.5 seconds and even lasts 80 days in deep sleep mode. Acer Always Connect remembers frequently visited Wi-Fi spots and connects you to the Internet in just 2.5 seconds. No more waiting. Built-in 802.11a/b/g/n Wireless provides the freedom to roam to hot spots while Bluetooth® technology lets your wirelessly connect to other Bluetooth-enabled devices such as phones and printers, eliminating the need for cables. The 5MP rear facing camera and front facing camera present clear, life like images for capturing snap shots or enjoying high-quality face-to-face chats. With AcerCloud your PCs storage IS your Cloud storage with wireless access to your photos, music, videos and documents — wherever you are, on any PC, on all your devices!